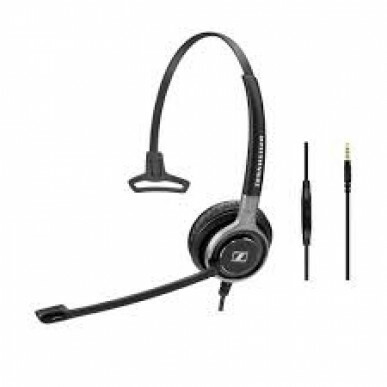 The Sennheiser SC 635 Mono USB and 3.5mm Corded headset aka 'The Century' is Sennheiser's premium USB (for computer) and 3.5mm (for mobile/tablet connections) ultra noise cancelling (UNC) mono headset. It's designed to be used with Computer, tablet and mobile phone that use a USB and 3.5mm jack . 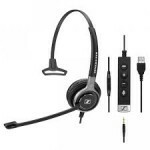 The SC635 headset has an over the head wearing style, with rotatable microphone for left or right hand side wear. The 635 is a plug 'n' play solution regardless of the platform and is optimized for UC and Certified for Skype for Business. Where to start!!??? The SC600 series is the ultimate, the bees knees, the dog's.... well you get the idea - Sennheiser are pretty proud of it. But what to WE think of it? Pretty much the same actually. Sennheiser have an unrivaled reputation for all things audio and this headset is no different. 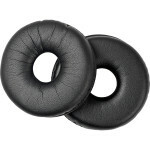 If you are buying a headset for someone who wants the best corded headset that money can buy - stop reading, you've found it, just add to cart now. The Century has HD voice clarity, an ULTRA noise cancelling microphone but is still lightweight and comfortable enough to wear all day. That ultra noise cancelling microphone means that the person you're speaking to won't hear anything but your dulcet tones. Great for dictation in a noisy office as Dragon (or other) won't get confused with the background noises - so this will minimise the error rate. As for conversations, most of our headset team wear UNC headsets (albeit wireless) so call and ask for a little over the phone demo of just how much noise it blocks out. Sophie, one of our headset experts who works from home, recently had some building work done. Diggers, drills, saws, hammer, not to mention the builders' appalling taste in radio stations - all blocked out for our clients by the Ultra Noise Cancelling microphone. No help for Sophie, unfortunately - she had a headache every day of the build! But her callers would never have known she was anywhere but a tranquil penthouse corner office. The speakers are made from high quality neodymium so you can hear every utterance. It's 'wideband' so you won't get that flat tinny quality to the voice - the 600 series enhances the voice to sound entirely natural. 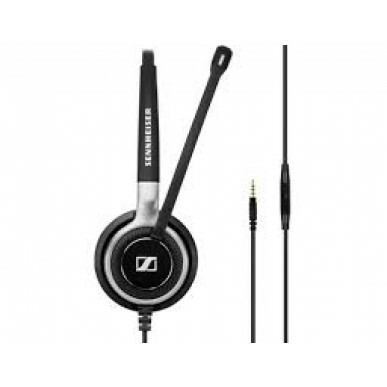 Sennheiser have so much faith the SC600 series that they give them a 3 year warranty. Nice peace of mind! There’s really nothing bad to say about the Century per se – the only thing to consider is if your environment is noisy enough that you want an ultra noise cancelling microphone, you may wish to consider a binaural headset (on both ears) to help you concentrate. 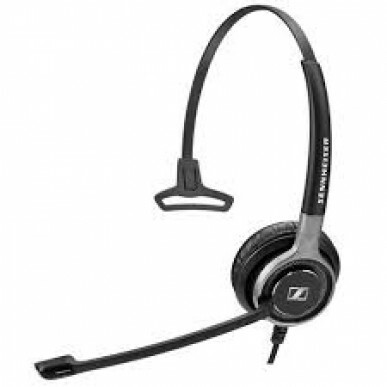 If staff sit close together or noise levels are high, Sennheiser SC 665 may be a better option as it is binaural and helps staff to focus in a busy / noisy environment. If you don’t need the ultra cancelling microphone or every bell & whistle, the SC 45 & SC 75 are both great value mid range options. 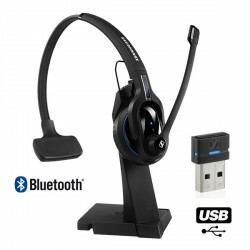 Of you want to be untethered and get bit more freedom in your life, most people these days opt for a Bluetooth option. It makes switching between devices a doddle and will improve your productivity, particularly if you don't HAVE to be at your computer all the time. Long call? Make a cuppa, answer the door, water your plants or get to your next meeting with Sennheiser MB Pro 1 UC and of course the UNC mic means your caller will be none the wiser. If you think 2 ears are better than one, the MB Pro 2 UC is your best cable-free choice. Cable Length Headdset to 3.5mm jack 138.5cm, + usb cable.